Bird Identification Workshop – Saturday 6th December, 1 to 3 PM, at NVIT room L017 (downstairs). Once again we are running a bird identification workshop covering species likely to be found in winter in the Nicola Valley area. This is a good way to tune up your skills before the Merritt Christmas Bird Count on 14 December. Or just get a better idea of what birds are visiting your feeder each winter. The 2-hour workshop will be an informal look at photos of local species and discussion of identification tips. 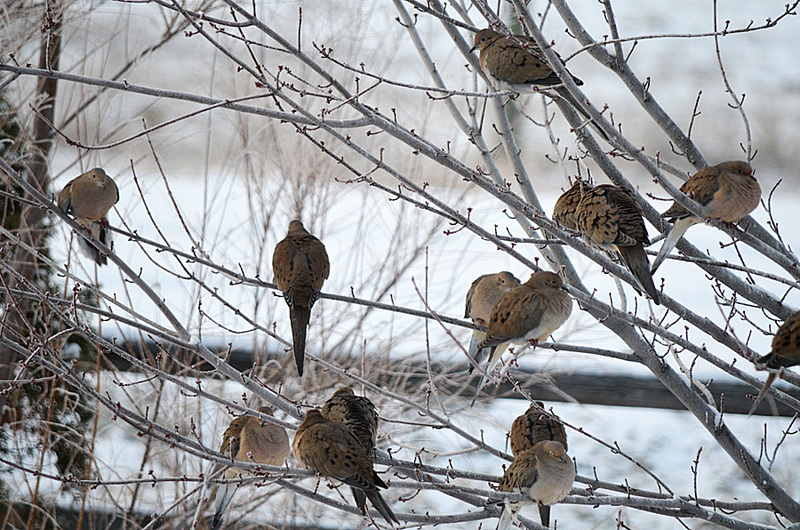 Test your skills – here are some species likely to occur in the Nicola Valley in winter. Scroll down – way down – to see the species identities. Mystery species #1: Notice the long tail (therefore not a falcon like a Merlin). This and the long thin legs tell you that it is an Accipiter species. 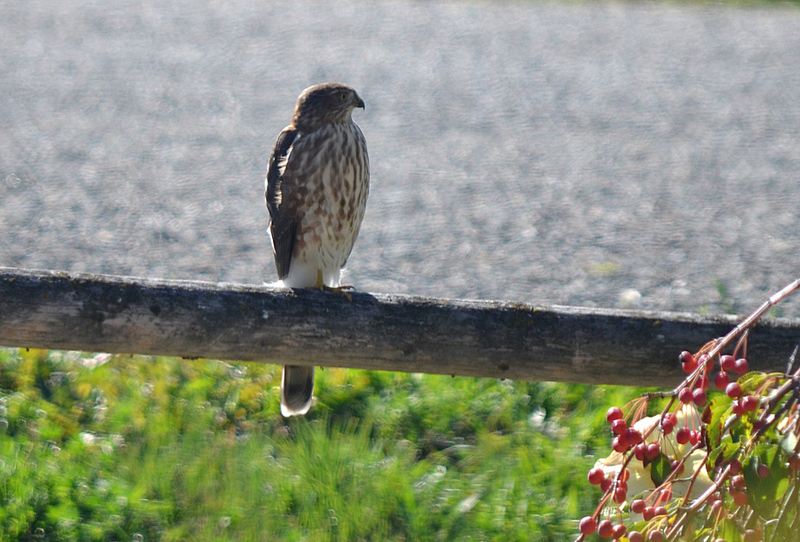 But is this Cooper’s Hawk or the smaller Sharp-shinned Hawk? In winter the latter is much more common in the Merritt area. The tail is slightly squarish, and the bird is small and slim. It is a Sharp-shinned Hawk. 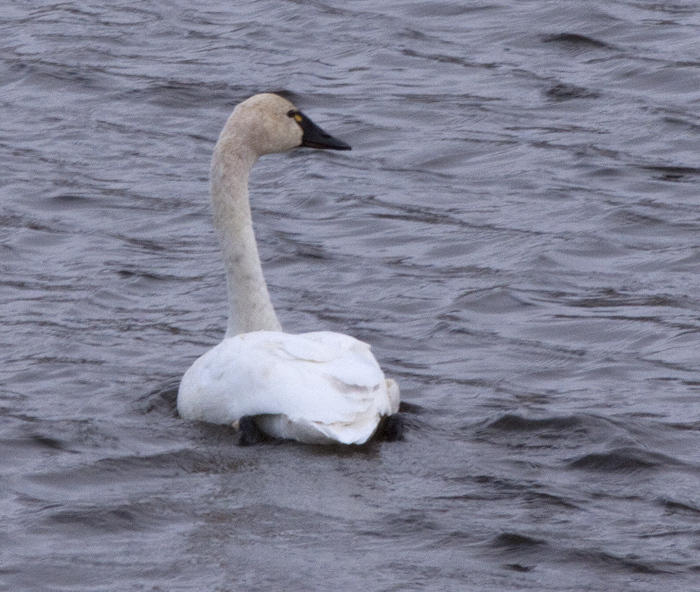 Mystery species #2: We get two species of swans passing through the Nicola Valley on migration and over-wintering (while there is open water on the lakes): Trumpeter Swans (the most common here) and Tundra Swans. Tundra Swans are slightly smaller, have slightly shorter necks and, if you can pick it out, have a small patch of yellow just in front of the eye. The shape of the bill is also slightly different (check a field guide). This is a Tundra Swan. 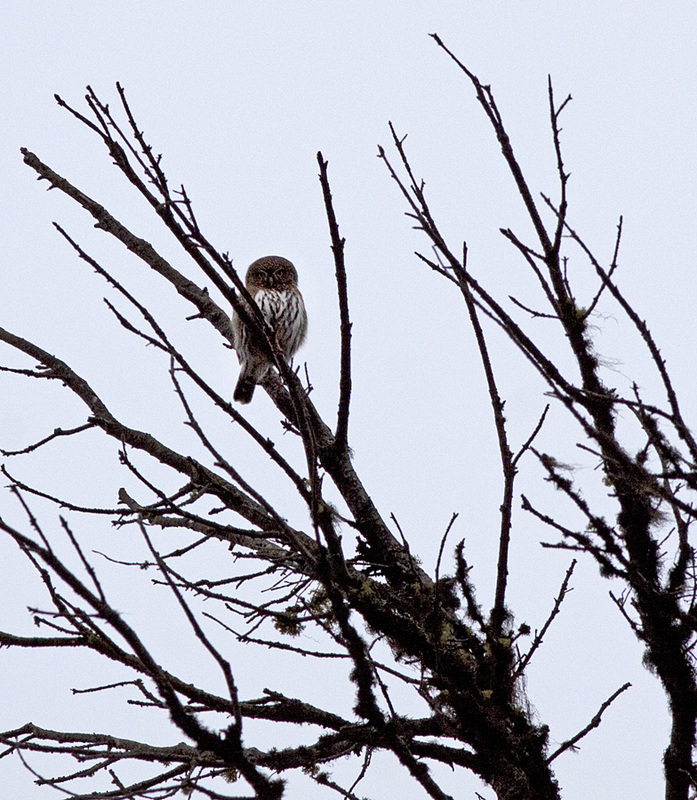 Mystery species #3: Rounded body, relatively long tail and tiny size make this a Northern Pygmy Owl. The fact that it is active during daylight also separates it from other small owls. Often sit on the tops of trees scanning for prey – small birds. Mystery species #4: The robust conical beak tells you that it is a seed-eating finch. 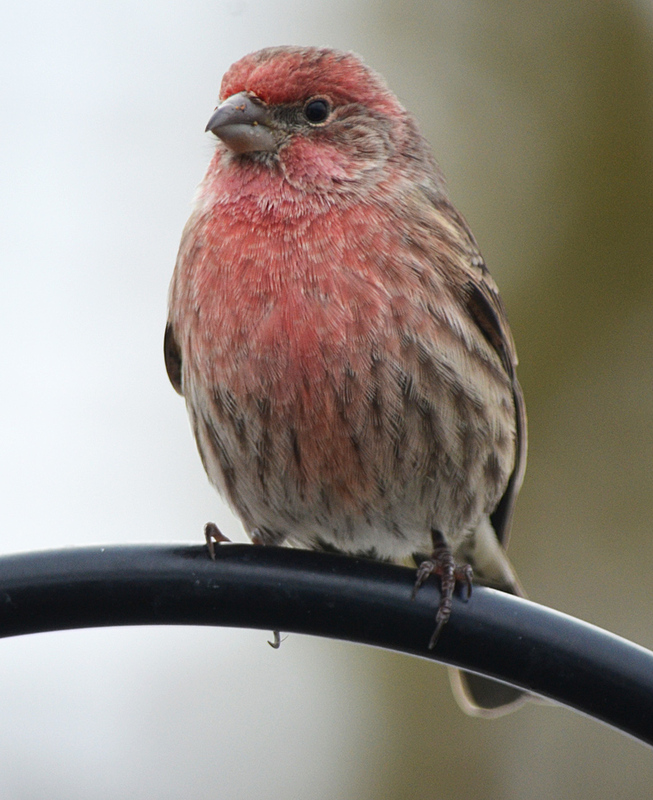 We get three species of pink/purple finches in BC: Purple, House and Cassin’s. In the BC interior the Purple is very rare and Cassin’s is common but only in spring and summer. The House Finch is here year-round, often at feeders or in town. This is a male House Finch (the female is grey-brownish and very streaky). The brownish crown and strongly curved upper beak also distinguish this species from the other two. Mystery species #5: Another seedeater but with a much smaller beak. About the same size as a Pine Siskin, the red forehead and pinkish breast tell you that this is a redpoll. There are two species of redpoll, but the Hoary Redpoll (which is much paler than this) is a very rare winter visitor to the southern interior. 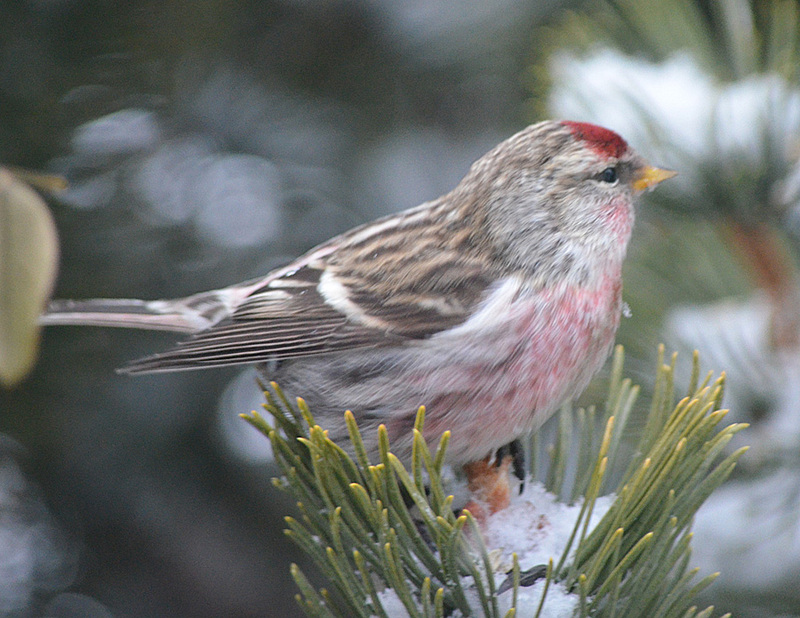 This is a Common Redpoll – a fairly common winter visitor which migrates south from the northern boreal forests. Mystery species #6: Two species of doves are now common in Merritt: the native Mourning Dove and the introduced and rapidly increasing Eurasian Collared Dove. The doves in this photo lack the square tails with obvious bands and the dark collars of the latter species. The long pointed tails confirm that these are Mourning Doves. Mystery species #7: Its a woodpecker, but Downy or Hairy? Both occur in our area year-round. 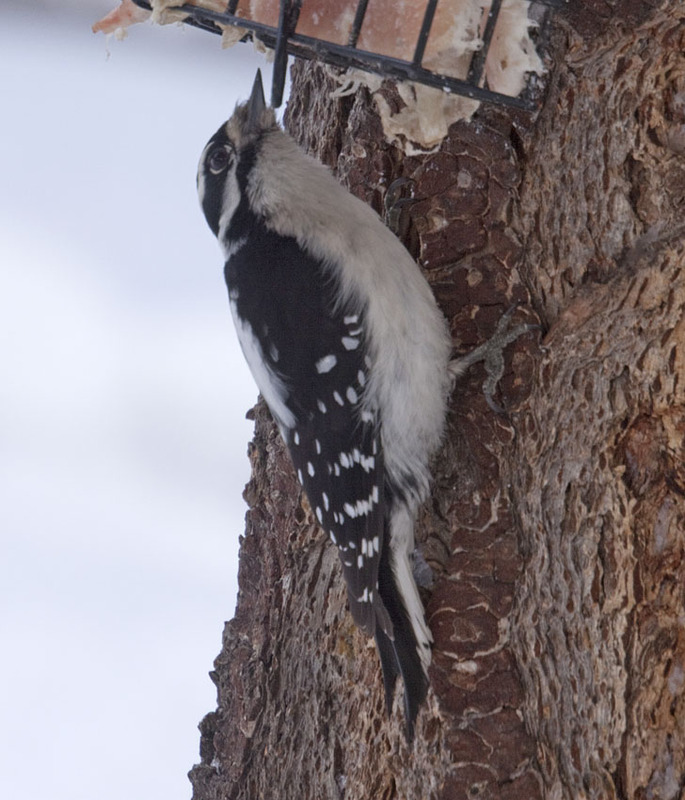 The beak is small relative to the head which makes it a Downy Woodpecker (which is overall much smaller than the Hairy). If you look closely you can see tiny black marks on the white outer tail feathers. Downies have these but Hairies have pure white outer tail feathers.